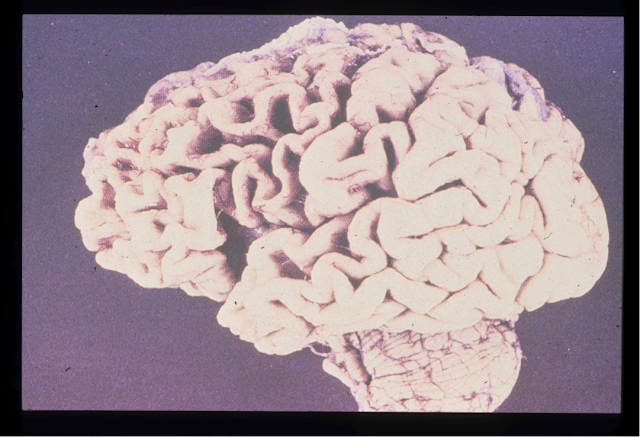 Pick’s disease, characterized by loss of brain function, is similar to dementia and Alzheimer’s disease. However, it is rarer and tends to affect only certain areas of the brain. In Pick’s disease, the damaged areas of the brain have abnormal substances called pick bodies and pick cells. All cells normally contain a type of protein called tau. But, many Pick cells have an abnormal amount or type of tau. The cause of Pick’s disease is unknown. The disease can occur in both men and women but is more common in women. It can affect a person in early adulthood but usually begins in middle aged to older adults. Pick’s disease can slowly progress and over time, temporal and frontal lobe tissues of the brain will shrink. This disease causes changes in behavior, neurological processes, communication skills, and emotions and affects just about all aspects of normal daily activities. It is the difference in symptoms, particularly behavior problems that distinguishes Pick’s disease from Alzheimer’s disease. In Alzheimer’s disease, the earliest and main complaint is memory loss. The earliest symptoms in Pick’s disease relate to behavior, especially in social settings. Symptoms of behavior changes include behavior that is not congruent with the social setting, compulsive behavior, repetitive behavior, withdrawal and decreased attention to or lack of personal hygiene habits. Changes in behavior continue to get worse until the person is unable to function and interact appropriately in social settings. Neurological, thought and physical processes are all affected by Pick’s disease. Some of these symptoms include progressive memory loss, difficulty with coordination and movement, muscle rigidity and generalized weakness. A person with the condition will have problems with their communication and language skills. These problems include a decrease in the ability to read and write, the repetition of words they hear and difficulty in understanding. Some patients get to the point that they are unable to speak. These patients do not show appropriate emotion and may even appear to be emotionless. Their mood may look inappropriate or inconsistent with what is happening at the time. They will have a loss of interest in activities and may stop participating in all activities including personal hygiene. They may look as though they no longer care about what is going on around them. According to The Alzheimer’s Association in the article “Alzheimer’s Disease / Treatment,” there is no cure for Pick’s disease. There are medications and non-drug treatments that may temporarily help with mental and behavioral symptoms. There are healthcare providers on the healthcare line of continuum that focus on care at different points of the disease process. These providers include hospitals, out-patient clinics, home health agencies, assisted living facilities, long-term care facilities and hospice agencies. Pick’s disease is so debilitating that eventually, the patient may need monitoring around the clock and assistance with all care. This can be an enormous strain on loved ones and other caregivers.